The salon is accessed either by a door from the Mezzanine Deck or the Starboard side door. The cabin sole is teak. It has an L shaped sofa facing a TV in a cabinet. The lower helm is on the starboard side with easy access to the outside rail when docking. Forward of the salon down a small stair case is the galley port side with a dinette starboard. There is a bookcase located under the stairs to the Mezzanine Deck. The galley is located forward of the salon and down a small stair case. The dinette is starboard of the galley on the same level. The windows of the boat let in beautiful natural light above both the dinette and cooking area. 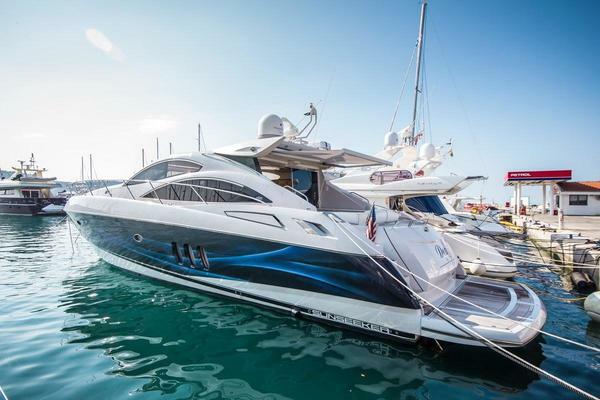 Shaken Not Stirred has excellent entertaining capabilities, with plenty of galley storage. FORWARD STATEROOM: The forward stateroom is on the same level as the galley three steps down and forward of the salon. 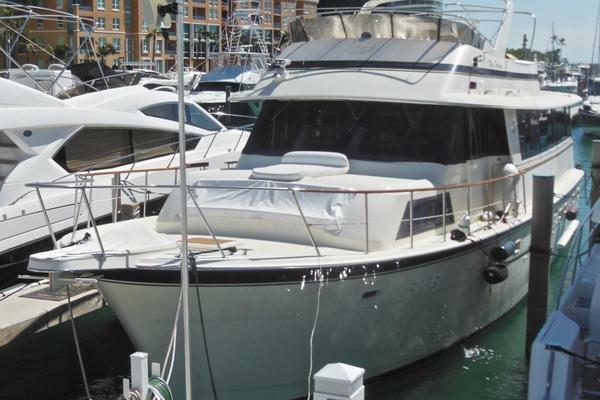 There is a full queen berth including storage with drawers beneath, teak cabinetry, and a wardrobe. It also has a vanity & chair, a TV, and it's own private entrance to the second head. Height 6' 6"
MASTER STATEROOM: The master stateroom is located three steps down aft of the salon. The master stateroom is furnished with a full queen and has night stands with drawers port and starboard. Running down the starboard side is a large hanging wardrobe, cabinets, and a beautiful vanity & chair. Finishing out the port side is the TV cabinet and a separate private door to the cockpit.Height	6' 6"
Forward Head: The forward head is located on the port side and contains a sink, toilet, and an over the toilet shower. The forward stateroom has a private entrance to this head separate from the main door. Aft Head: It is located on the starboard side aft as part of the master stateroom. It contains a sink area with a medicine cabinet and mirror, marine toilet, and a separate shower stall with sliding solid doors. Relax on the mezzanine deck in rain or shine conditions under the cover of a fiberglass hard top with a Isinglass enclosure. Entertain easily with a comfortable table and chairs, along with a freezer, ice maker, and wet bar just forward of the table. Height	6' 7"
The cockpit is accessed by steps from the Mezzanine Deck and is equipped with rod holders, a wet bar, a fishbox, and a door to the Master Stateroom. The cockpit is newly painted in October of 2018. The cockpit is also equipped with a transom door on the starboard side accessing the new swim platform. Features on the swim platform include a 3 step dive ladder and access to the shore power fixtures. The Bridge is accessed with steps from the Mezzanine Deck and is protected by a fiberglass hardtop. The GPS, RADAR, VHF antennas, tender davit, and cradle are all mounted on the hardtop. The upper helm is mounted forward with one swiveling captain's chair and guest seats. Features on the upper helm include full gauges package and engine controls as well as a Garmin GPS, Standard VHF, bow thruster control, and intercom. 2-Detroit/Johnson Towers, 6 cylinder, 485 HP, fresh water cooled/heat exchange, turbo charged, counter rotating, via hydraulically actuated marine reduction gears, marine diesels. Primary and secondary fuel filters (Racor). Heavily constructed FRP engine beds with welded steel shock absorbing motor mount beds. Mechanical engine kill cables. 1-Northern Lights, 8KW, three cylinder, fresh water cooled, naturally aspirated marine genset with primary and secondary fuel filters, MFG sound proof box, drip pan, dedicated exhaust, dedicated starting battery. BATTERIES: 3-Group 8D/12VDC (gel cell) 1-Group 24/12VDC genset starting. All batteries secured in acid resistant trays/boxes with approved connections, cable routing, support and access. WIRING: Thermoplastic covered boat cable gauged, routed, secured and connected generally as per NFPA 302 and ABYC Standards in effect at the time of construction. Commercial 12VDC/120VAC service/breaker panels. GFCI circuitry as required. Dual leg, 30 amp shore service fitted with dual pole breaker.